Has your baby mastered the art of sitting and crawling? Then he will probably be ready to stand on his own feet soon! Learning to stand up will be a major milestone on the way to your baby’s first steps. Before your baby learns to stand up he will need to gain muscle strength and coordination, and first be able to roll over and sit. Once your baby has mastered these skills he will be ready to stand up, which will require more muscle strength in his legs, for him to learn how to bend at the knees, and be able to shift his own weight. When will my baby learn to stand up? 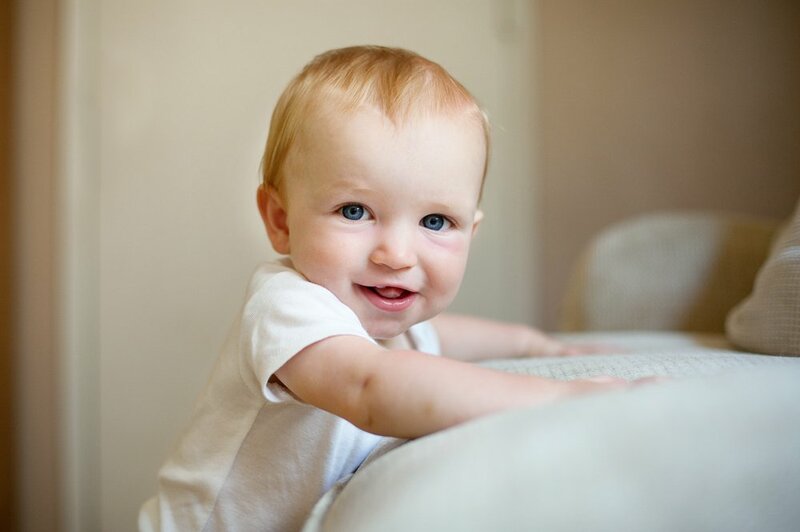 Around month 4 and 7 you will notice that your little one starts to spend more time trying to sit up, this is a great moment for you to help him try and stand up for the first time. While sitting down gently pull him up from the arms. At first you will notice your baby may stand up, but will need lots of help and support from you. Around month 6 your baby may be able to bear weight on his feet and bounce up and down actively, so try practicing this on a hard surface like the floor. Between month 6 and 9 your baby might try to pull himself up and succeed for only just a few seconds before falling backwards. Remember to keep an eye on your baby during this phase; although he might learn how to stand up fairly quickly, sitting back down again is another matter. You may find your little one clinging on to furniture and even crying because he can’t work out how to sit back down again. Help him during this transition, instead of picking him up and sitting him down again, show your baby how to bend his knees. Then encourage him to try again and reassure him that it will be ok.
By the time his first birthday comes along, your baby will probably be able to stand up by himself and will be ready to take his first steps. Always remember that babies develop at different paces, if you are concerned about your baby’s physical development make sure to talk to your pediatrician about it. How can I help my little one learn to stand up? Give him safe furniture to pull up with. Remember your little one will try to help himself up with anything he can reach, so make sure the furniture at home are sturdy pieces he can hang on to without it falling over. Prevent accidents and baby-proof your home. Use the stairs to teach balance. Learning to stand up is all about confidence and balance! The short height of a step makes it the perfect spot to practice pulling up. Place your baby in a sitting position next to the step and encourage him to pull himself up by using the edge of the step. Make sure you are always supervising this activity. Place his toys up high. Encourage your baby to stand up by placing some toys on the sofa. When he pulls up on it, he’ll be so intrigued with the toy that he’ll remain standing there for a long time, helping him practice balancing. Bounce your baby up and down. Place your little one standing up in front of you so he can bounce up and down while you hold his hands. This activity is fun for both you and your baby, and will help him strengthen his leg muscles and learn how to bend his knees. Why barefoot is best for babies!